I have been hiking for at least 20 years but backpacking for only the last five years.� Most of my backpacking is done as overnight trips and occasional weekend and week long trips.� My typical pack weight is approximately 18 to 20 lb (8 to 9 kg) before food or water.� Most of my backpacking is the three season variety in the mountains of Maryland, Virginia, Pennsylvania, and West Virginia.� In addition to backpacking, I also fish, hunt, and enjoy orienteering.� As a result, some of my backpacking equipment gets use in a number of different venues. 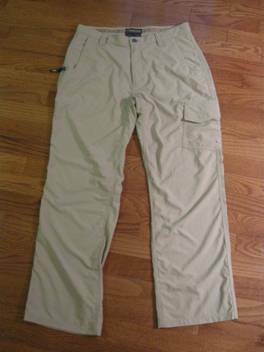 The Mountain Khakis Snake River Pants (i.e., the pants) are a 100% nylon hiking pant.� The pants have a diamond shaped gusseted crotch for ease of movement.� All the major seams are triple stitched and stress points around the pockets are bar tacked.� The pants close at the waist with a 5.5 in (14 cm) zipper and an antique-brass riveted shank button at the top.� There are also six 2 in (5 cm) belt loops around the waist.� The inside of the waistband, as well as beneath the front zipper, is lined with 0.5 in (13 mm) grosgrain. 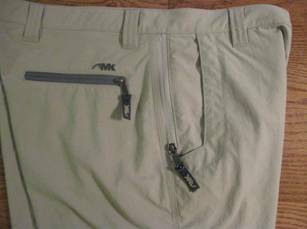 The pants have two front pockets which have a squared-off opening at the bottom.� The insides of the pockets are constructed of a nylon mesh fabric.� The front pockets are approximately 6 in (15 cm) deep.� The right front pocket also has a zippered security pocket with a 6 in (15 cm) zipper with a Mountain Khakis logo hanging from the zipper pull.� The pants also have a right rear zippered pocket with a 5 in (13 cm) zipper (also with the Mountain Khaki logo).� This rear pocket is also lined with the same mesh fabric as the front pockets and measures approximately 6 in (15 cm) deep. On the left leg, there is a cargo pocket 11 in (28 cm) below the waistband.� This pocket measures approximately 7 x 7.5 in (18 x 19 cm) and has a flap covering it which measures approximately 3 x 7.5 in (8 x 19 cm).� This pocket closes with two small squares of hook and loop fastener.� In addition, this pocket has a small pleat on the rear portion of the pocket.� Inside this pocket is a smaller zippered security pocket which measures approximately 5 x 5 in (13 x 13 cm). Lastly, I also noted that the lower rear portion of each leg has a double layer of fabric which measures 3 x 10 in (8 x 25 cm). The Mountain Khakis Snake River Pants appear to be very well made.� The stitching looks to be just about perfect.� I do not see loose threads or uneven stitches.� The zippers all operate smoothly.� There are some very nice features that leads me to believe quite a bit of thought went into designing these pants.� The triple stitching of the main seams, bar tacking around the pockets, and double fabric on the lower leg are just a few things that make me believe this. The fit of the pants seem just about right.� I thought that the inseam might be a little long but my wife tells me they are just right.� I also measured the inseam and it appears to be right at 30 in (76 cm).� The fit around my waist is good.� I usually can wear a 34 in (86 cm) waist and these fit just fine.� The fabric is light and has a fairly smooth feel to it. 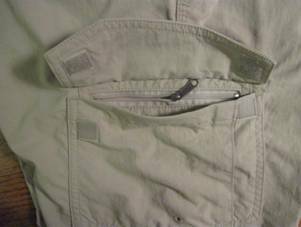 The pockets are in good locations and are large enough but not too deep.� I hate pockets that are so deep that I feel like I�m bending over to grab something at the bottom.� The rear hip pocket easily holds my wallet and can easily be zippered closed.� The left cargo pocket is not as large as those found on military uniforms but will easily hold a cell phone and some snacks.� Even the inner security portion of the cargo pocket can hold a cell phone or keys.� I also like the zippered front pocket.� I often use this type of pocket to ensure I don�t lose my keys while day hiking. The gusseted crotch is a main feature of the pants and I can�t say that I have noticed any particular advantage but I haven�t hiked in them yet.� I will see how this works out over the coming months. I�m not clear what the function of the grosgrain around the waistband and under the front zipper is.� The manufacturer appears to use it on most of their other products but I�m not sure if it is comfort thing or what. The washing instructions indicate that the pants are to be machine washed in warm water and tumble dried on low.� The instructions also indicate that the pants could be steam ironed with medium heat.� We�ll see how that ironing things goes while on trail � not. Weather conditions have varied pretty wildly over the past two months here.� The temperatures I encountered on the hikes ranged from 25 to 60 F (-4 to 16 C).� I also encountered light rain and snowy conditions on a couple of hikes.� No major downpours or snow, just light varieties of both. I have also worn the pants around town running errands and as a spare pair of casual pants while attending a conference in Nashville. The fabric has held up very well.� It seems to be a more heavy duty fabric than I have found in other nylon hiking pants I own.� I have not seen any tearing of the seams or signs of the fabric wearing though.� All the zippers seem to be functioning properly.� I typically find wear on my pants on the inside of the leg at the ankle but haven�t seen that yet on the Mountain Khakis.� I have been wearing low-cut trail shoes but as the weather is colder I will probably be more likely to wear boots and will keep a watch on how well the fabric holds up.� I did wear the pants in a light rain and they got wet but dried pretty quickly.� Not unexpected for nylon pants but it certainly confirmed my expectation. The arrangement of the pockets is good and I really like having the cargo pocket on the leg.� The inner pocket usually holds my cell phone, and since it is zippered, I don�t have to worry about it falling out and getting lost.� I find that the rear hip pocket is a little hard to get into.� The zippered opening on this pocket seems tight and I have a tough time reaching in to get things out. After washing and drying the pants, I do note that they can come out with wrinkles.� This is also true if they have been folded or rolled up (as in a pack).� If I plan on wearing them around town, I have found that a little ironing helps.� I felt this was necessary once when wearing the pants at a conference just before I was to fly home.� I didn�t feel that they looked good enough to take out of the suitcase and wear as is, without some ironing.� As for wear on the trail, I think straight out of the drawer is fine. 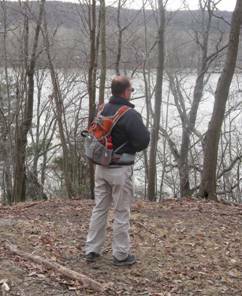 Over the last couple months I have use the Snake River Pants on four day hikes in the central Maryland area.� The hikes ranged from 4 to 8 miles (6 to 13 km) in length.�� All these hikes were on well maintained but often rocky trails in Seneca Creek State Park or in the C & O Canal National Historic Park.� The temperatures ranged from 20 to 45 F (-7 to 7 C) and usually clear or overcast skies.� I did take one of these hikes during a light snowfall with approximately six inches of snow already on the ground. I used these pants during one orienteering event in Greenbelt Park here in Maryland.� This race was 3 miles (5 km) in length and was definitely off-trail.� This park should be known as greenbrier park with all the thorns there.� I also have continued to wear them on a regular basis around town. These pants have continued to wear very well.� I wanted to see if there were any more wear when I hiked in boots, rather than low-cut shoes.� All the hikes I took during this long-term test period were done in hiking boots.� I was particularly interested in the lower inside leg and I have not seen any undue wear on the pants up to this point. �There are some small scuffs but nothing that has me concerned in the least.� All the zippers continue to function smoothly and al the seams are holding fast.� I haven�t seen any worsening of the small pilling of the fabric that I mentioned in my Field Report.� My overall assessment is that these pants are very well constructed. Wearing these pants while orienteering gave me greater confirmation about the range of leg movement.� During this event I was often stepping over logs and rocks and I felt that the Mountain Khakis provided good range of motion without binding.� Another thing that I noticed was that I found that I didn�t get as many leg cuts and scrapes as usual.� Orienteering is notorious for cuts and scrapes, especially on the lower legs (orienteers usually wear padded gaiters).� It seemed like the pants could withstand the briars a little better than I would have expected. 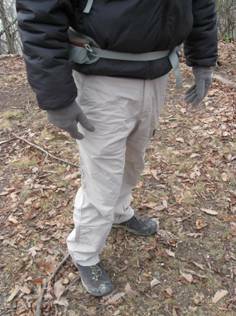 With the colder temperature we have been seeing here in the last couple months, I noticed that the pants are a little warmer than other nylon pants I have.� The fabric is heavier and I guess that shouldn�t be unexpected.� I did hike in the coldest weather with a light baselayer underneath the pants and found that there was no problem with the layering.� The pants had ample room for an additional layer. The Mountain Khaki Snake River Pants are nylon hiking pants with a diamond-shaped crotch area which allows for increased freedom of movement.� The pants have a total of six pockets, three of them with zippers, including a cargo pocket located on the left leg.� The nylon fabric is very sturdy and dries quickly.� Some minor problems that I have seen are some fine pilling and wrinkling of the fabric and that I have a hard time getting my hand into the rear hip pocket. This concludes my testing of the Mountain Khakis Snake River Pants.� I would like to thank Mountain Khakis and BackpackGearTest.org for the opportunity to test this item.